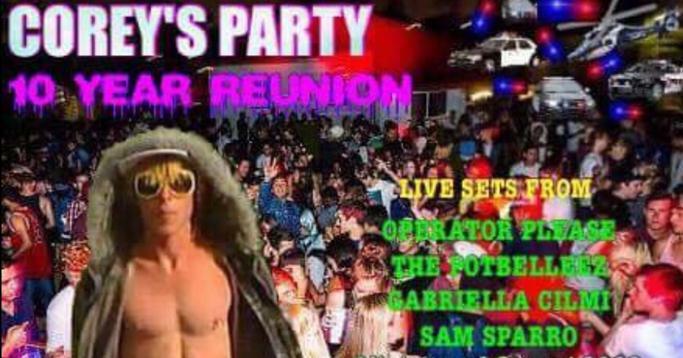 Back in 2008, 16-year-old Corey Worthington threw a party that became soo massive that he (and those uggo yellow sunnies) went down in the history books as the image of Australia’s no.1 party animal. While the guy himself has since grown up, even getting married and owning his own home, his epic party lives on in our national folklore. He was just a teen with a dream. A dream where he posted his parents address on the internet and attracted over 500 party-goers, in the process trashing his entire neighbourhood. Don’t be hatin’. It became a country-wide scandal, made international headlines and Corey became an icon to some (but a bit of a knob to the rest of us). Now, a Facebook event has popped up in January, planning to celebrate the party’s 10 year anniversary. Over 3 thousand people are already clicking attending, but almost 10 thousand are interested. This could be 2017’s biggest piss-up. “As I’m sure you’re well aware, we’re approaching 10 years since that rager at Corey’s place. Thought we could all reunite for a little catch up, 10 years on! Would love to see how we all are, so feel free to bring your partner and/or kids along. It’ll be BYO again and if you could each bring a plate of something as well that would be fantastic. Still sorting out entertainment for the night, at the moment we’ve locked in some big names from that era that have stood the test of time; Operator Please, The Potbelleez, Sam Sparro, Gabriella Cilmi and DJs will be spinning the Ministry of Sound 2008 annual (loads more TBA). Like many of these FB dank events, this probz is totally all for lolz. Since Corey himself has no affiliation with the party, we will wait and see whether the event is pulled down, or will in fact rage ahead.